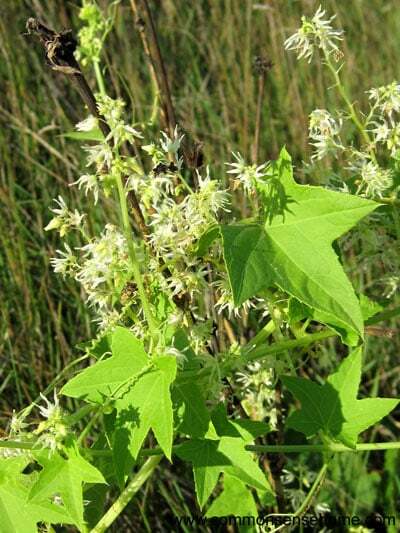 Today’s featured plant is Wild Cucumber, Echinocystis lobata. Wild cucumber is also known as Balsam Apple, Prickly Cucumber, Wild Balsam Apple, Wild Mock Cucumber and Lace Pants. The term “lace pants” comes from the appearance of the dried fruit. Wild cucumber is native to North America, and can be found throughout much of the US and Canada, extra for certain areas in the southeast, southwest and extreme north (see map). It prefers wet areas with some shade, including deciduous woods. We normally find it growing in low lying parts of our prairie area, but this year because of the drought there weren't as many plants as usual. 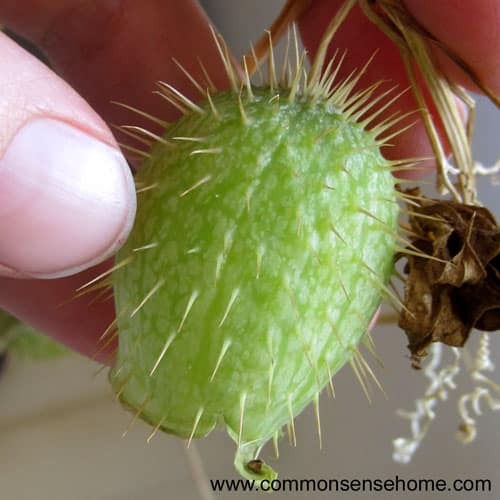 The plant is an annual vine, flowering in summer and fall and setting fruit that resemble small, very prickly cucumbers. They are not related to garden cucumbers, Cucumis sativus, although today we did find a cucumber beetle in one of the fruits. Wild cucumber vines reach from 2-10′ (60-300 cm). The leaves are large and lobed, resembling maple leaves in shape. The stem is square, and like garden cucumbers, it has curling tendrils that allow it to grasp and climb. It readily overgrows trees and shrubs. The flowers are small, white and very fragrant. Wild cucumbers have both male and female flowers. The male flowers emerge in round clusters about 4-8″ (10-20 cm) across with individual flowers 1/2″ (1 cm) wide. They have six thin petals. A single female flower is found at the base of a male flower stalk. There are some beautiful photos of wild cucumber at Ontario Wildflowers and Nature Manitoba. Illinois Wildflowers states that the wild cucumber flowers are visited by several species of bees, flies and wasps. I have not found any reference to wildlife eating the seeds. Natural Medicinal Herbs states, “The pulverized root is used as a poultice for headaches. A very bitter tea brewed from the roots is analgesic and is also used as a love potion. 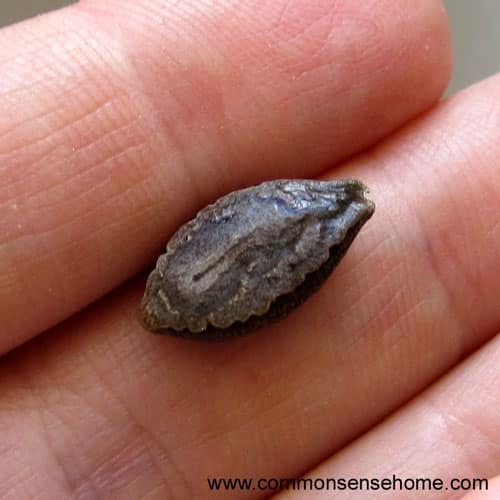 It is used as a bitter tonic for alleviating stomach troubles, kidney ailments, rheumatism, chills, fevers etc.” They also mention that the seeds have been used as beads. What if I told you weeds and bacteria could save your life? Abbi – your decorations are cute! ” Wild geranium” starts of the article…is that another name for it? Neat little plant. Too bad its you can’t eat it. Love you site! Thanks for all your research. please do not eat the seads almost killed our dog!! very poison!! said 4-5 seads can kill a person!! be very careful!!! I actually even had a sort of craving for them while collecting them. Thanks for telling me about it being poisonous for dogs. I ate about 1/2 a teaspoonful on 2/11/15 and almost died. I vomotted non stop for about 3 hrs followed by diarrhea. Today is 2/27/15 and I still feel sick from it. I’m having an endoscopy and colonoscopy on 3/2/15. That would be why I recommend, “DON’T EAT THIS PLANT!” I’m sorry you had such a bad experience. Just eat the green ones not the black riped fruit. NO – this plant is not recommended for consumption. pretty to look at but very invasive and the spines hurt if stuck by one. I live in southern Ca. thanks for the site! She must have eaten a seed. Glad she’s doing better. Aha! Mystery solved. Won’t be eating this! Apparently it can get quite invasive. Will be pulling this spring. As kids we would throw them at each other. Great fun, they pop open on impact. Is there a way to rid of them? They are over taking the trees/bushes on the yard. Thank You! 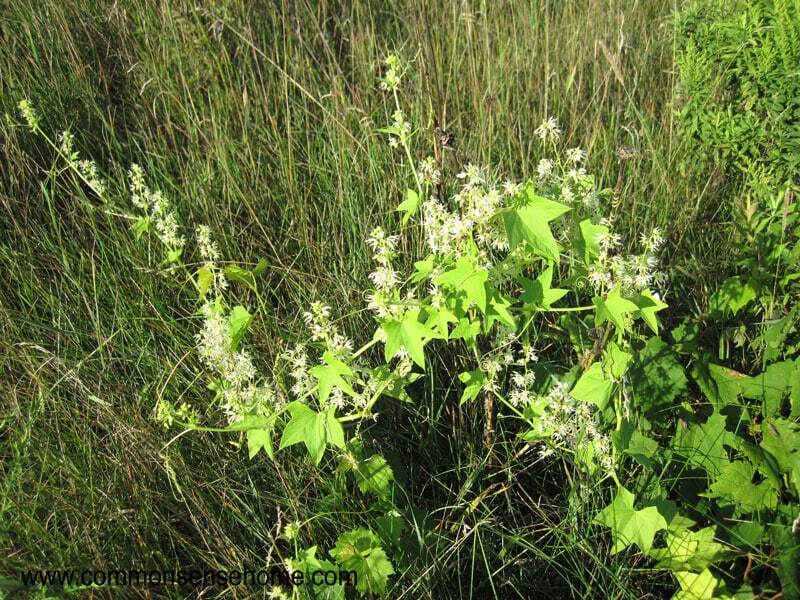 In “Weeds: Control without Poisons”, the author notes that large seeded annual broadleaf weeds like wild cucumber are best controlled by increasing soil fertility. Believe it or not, they thrive in poor soil. I’d consider mulching or top dressing the area where they are with compost. For short term control, we just pull them down if they start getting too crazy smothering a tree. why are there so many this year they are all over what can I do to get rid of them? I’ve noticed that the wild cucumbers are abundant in our area this year, too. I’ve seen more this year than any year I can remember. They seem to like the weather. Lots of goldenrod this year, too. The plant is an annual, so it must start new from seed each year. 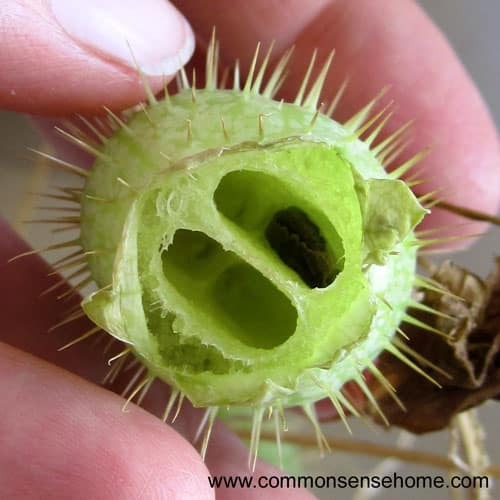 If possible, cut it back or pull it before it seeds out. Most weed seeds can persist in the soil for years, even decades, waiting for the right conditions to germinate and thrive. This was that year for wild cucumber. 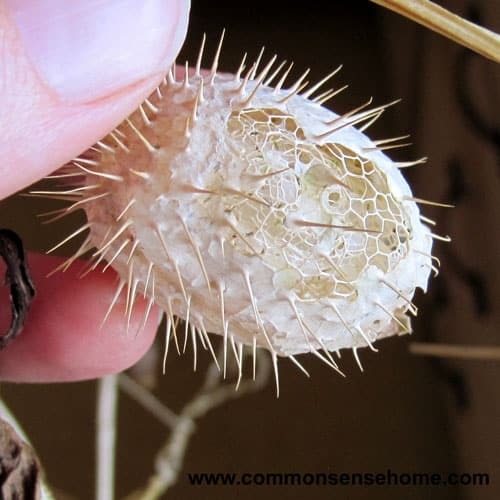 You can use commercial or homemade weed control sprays or other options (https://commonsensehome.com/natural-weed-control/), but they will affect the surrounding plants as well. There’s nothing species specific that I have found. will they kill dairy cows if eaten? I haven’t found wild cucumber listed in the dozen or so lists of plants toxic to cattle that I searched. Usually they will avoid a plant that’s toxic, unless there is absolutely nothing else to eat. You can dry the larger ones and use them as a loofah Sponge for the bath. Ours don’t get much bigger than a couple inches long. Do they grow larger in your area? As I understand it, only the seeds are a potential problem.Thanks for sharing your experience.